No matter how beautiful, spotless, and flawless you are, we’re living in a very strange era where makeup application is part of our daily activities. That’s why it becomes news-worthy when a celebrity intentionally or accidentally steps out with no single drop of concealers. But while it seems fair to say that we can’t entirely live without makeup, some of the makeup transformations are awe-inspiring, some are downright insane, and others you have to do a double-take in order to verify the person in the “before” photo is the same as the person in the “after” photo. In the case of the beautiful Bervelyn who got married in Ghana a few days ago, it was everything in between. Our first thought upon spotting the bride’s ‘before’ and ‘after’ makeup transformation on the ‘Gram was, WOW, that’s really the power of makeup at the maximum. But the reality of the situation is that we weren’t the only one that was stunned by her look. 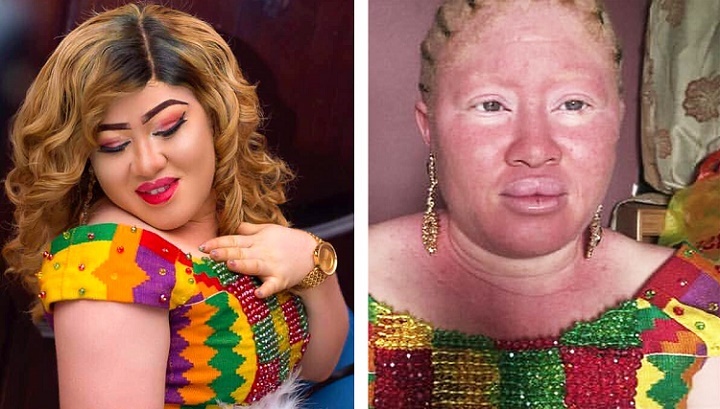 With the ‘before’ and ‘after’ images placed side by side, Instagram users couldn’t handle how beautiful the bride was, even the bride herself testified on her beauty. “Barima thank you for the beautiful make up.U made me sooo proud and elegant on my engagement day,” she commented on the image. While some users said it was a ‘total fraud’ and ‘cheat,’ some were on the notion that the makeup artist was able to conjure up the actual beauty of the bride. “Wow dis is gorgeous.  she is really feeling herself,” mrz_asamoah wrote on Instagram. “This is what we call transformation..well done dear,” comfytrends_makeover added. “OMG!! Bevelyn looked amazing!!! You did a great job!” tehminah, another user wrote. “My goodness, this is fraud, total cheat, whaaaat,” Usman Mariam commented on the picture on Facebook. “The look is nice, but she won’t look the least like that makeover everyday. Not even close. Why did the artist do SO much to make her look different? Makeup should COMPLIMENT & ACCENTUATE,” Ashely Foy added. However, in as much as people always have their own option, it was the groom’s comment that shut down the naysayers. “Barima thank you soooo much for the lovely makeup on my wife .U do all,” a man we assume to be the husband with the handle ‘paaakwasi417‘ commented on the picture.